Kerri Arista: Holla for the Collars! My brother is one of the best gift givers I've ever heard of! Long ago, he bought me my first really nice guitar. And also, as I've written about before, he's taken me to Hawaii a couple of times! He picks sometimes extravagant, always cool, very thoughtful gifts. So this Christmas, since I am all about my puppies all the time, the best gift anyone could give me would be something for them! 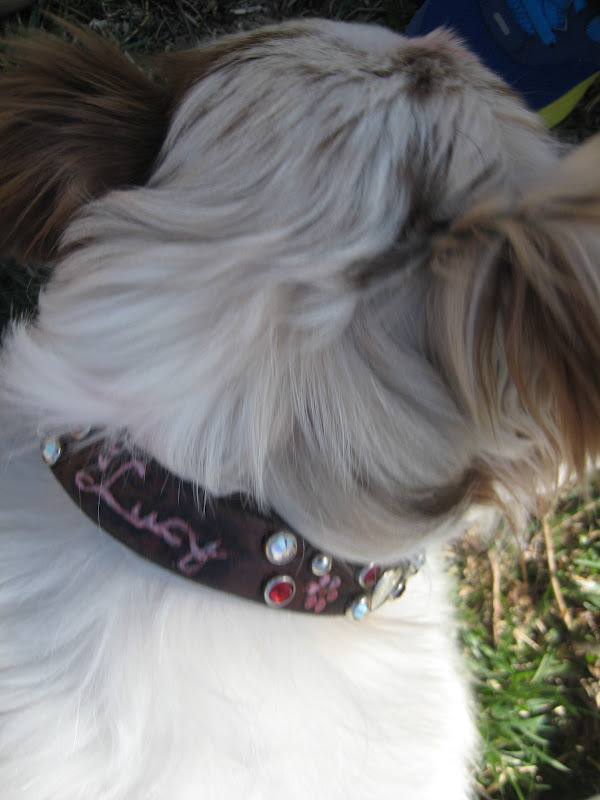 My off-the-charts-gift-giving-brother told me he was going to pay for both Ricky and Lucy to get custom leather collars by the uber talented Tricia Vaughan. 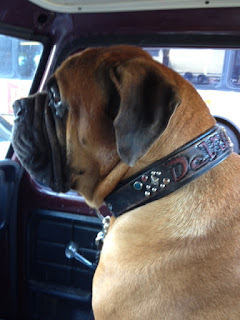 He had found her on the internet a while back when he had a super blingy collar made for his dog, Deville. Here is Deville wearing his collar. The Ricardo's and I were all super excited to start thinking about what their collars would look like. Up to this point, they've had generic collars that really just weren't snazzy enough for them. Tricia doesn't live in Texas, so there was a lot of emailing back and forth. I had some idea of what I wanted the collars to look like, but she was able to really bring it all to life and completely over-deliver! We were so thrilled the day we got the package in the mail-- just about a week before Ricky and Lucy's 1st birthday. How perfect is that? aren't they gorgeous? and just perfect for my two?! Ricky Ricardo's hand tooled congo drum is my favorite thing about his! Lucy's girly hearts and flowers twinkle, just like her! How snazzy does Mr. Ricardo look now? And how sweet is this collar on Lucy? We couldn't have been happier with the way these collars turned out. The photos I took don't even do them justice! They're really pretty unbelievable. Just like Lucy and Ricky! Oooo - very cool! We are just starting to gear up for our next little girl. She is with a rescue group and we will meet as soon as we get back from Hawaii. I have her pic on my phone and on my kitchen counter. She has the most soulful eyes and I feel like we have bonded already.... I know, weird! We will definitely have to consider a cool collar like this! !